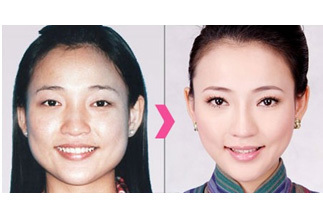 Finally a non-surgical treatment to reduce a square jaw and narrow a wide face! Often, people who chew excessively (gum chewers), people who grind their teeth or clench their jaw, over time will build up the masseter muscle. Building this muscle can change the natural shape of the jaw making it more square. With the use of Botox the square look can be eased and the shape of the jaw changed to a softer and natural angular look. This can be used on anyone with a rounded less defined facial shape and also effective for someone with a very square jaw. Botox is injected into the masseter muscles (the chewing muscles on either side of the jaw). In time this will relax the muscles giving the jaw a more angular or V shaped face. Within weeks the face will start to appear less chubby and the jaw less squared. The full results will be seen between 2 and 6 weeks. Dr. Ellis at Lasting Looks Anti-Aging and Laser Clinic in Toronto has been providing Facial Slimming Botox to our patients for many years with great success.